If you read the blog or know us, you probably know that we are really interested in the Paleo diet. 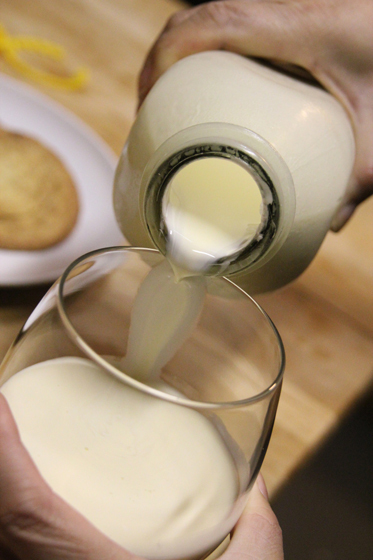 One of the points of contention in the diet among those who follow it are those who drink milk and those who do not. 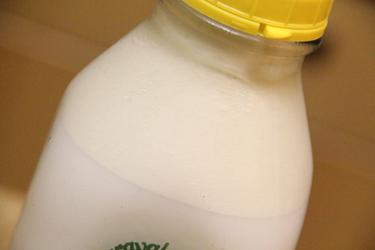 Humans (in agrarian societies) are the only animals that continue to drink milk after they’ve stopped nursing, so milk was not a regular part of the “caveman” diet. That being said, there are a lot of beneficial nutrients and enzymes in raw, grass-fed cow’s milk, so some people who follow the Paleo diet do drink milk – again, as long as it’s grass-fed, and not pasteurized. Well, Nick and I don’t drink milk too often anymore, but it is delicious, so we’ve had a few treats here and there – but raw milk is generally not sold in most grocery stores (and especially not big chain ones). Grass-fed products are hard to come by – there are a few (Kerrygold brand is grass-fed), but there have been so many scares with large production raw products being contaminated with bad bacteria during processing (Odwalla used to be unpasteurized but had an e.coli outbreak in 1996, causing them to begin flash pasteurizing their juices) that most supermarkets don’t want to take a chance with raw foods. 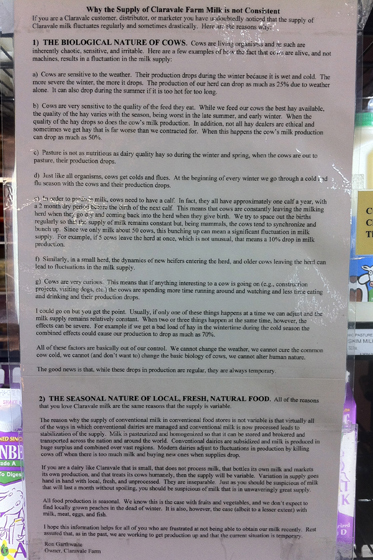 Rainbow Grocery – a place that has been there for a long time, but I only just visited for the first time recently – is one of the few places around that does carry raw milk. 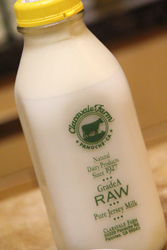 And while I’ve had the Organic Pastures brand milk (the only other raw milk I’ve seen on any shelf), the other day while at Rainbow, we saw Claravale Farms. Raw milk from Jersey cows (which are supposed to produce milk with “higher concentrations of proteins, solids, butterfat, and beta-caroteen than other breeds”), *not* organic by choice (due to inconsistencies in regulations on organic products), from a small farm near Monterey, CA. 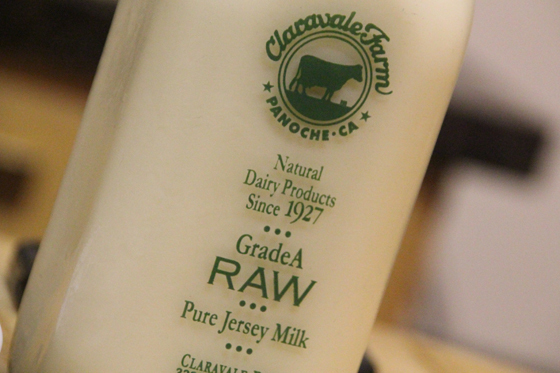 We were intrigued by the distinction of Jersey cows, and Claravale’s glass bottles. 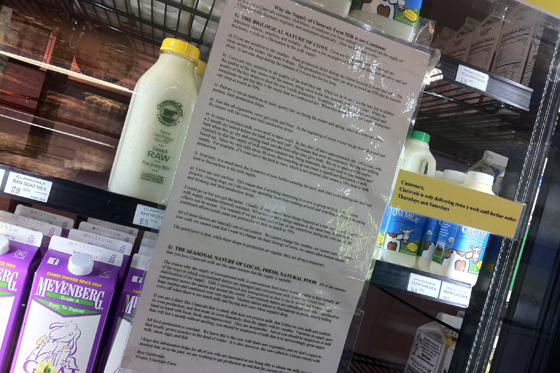 Last time we were in the store, there were no Claravale farms bottles on the shelf – there is also signage that states that Rainbow only receives deliveries on certain days from this dairy farm, and their product seems to get bought up pretty quickly. There was even a two-page explanation from Claravale as to why the supply of milk varies (different growth rates/quality of the pasture the cows feed on, the nature of cows, etc.)! 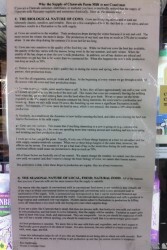 Looks like people are really upset when they don’t get their Claravale milk! We had to try it. 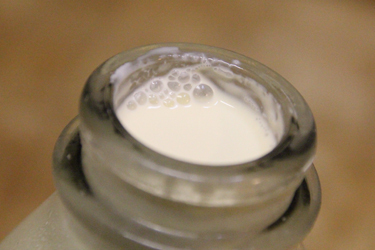 One of the other things that drew us to Claravale Farm’s milk was the very visible cream layer on their whole milk. YUM. Look at that heavenly cream layer. You can shake this up to distribute it more evenly, but we like leaving it intact and getting a bit of it, concentrated, in the pour. And the taste? Wonderful! I do believe raw milk tastes different than the processed, pasteurized, homogenized stuff you get at the regular grocery store. Compared to Organic Pastures, I don’t think I could tell a huge difference, except that cream layer on top is hard to beat (I don’t remember seeing it in the OP container – I guess we’ll just have to do a side-by-side comparison!). Especially since we don’t have milk often, I’ll definitely be splurging on this treat next time we are looking for it! 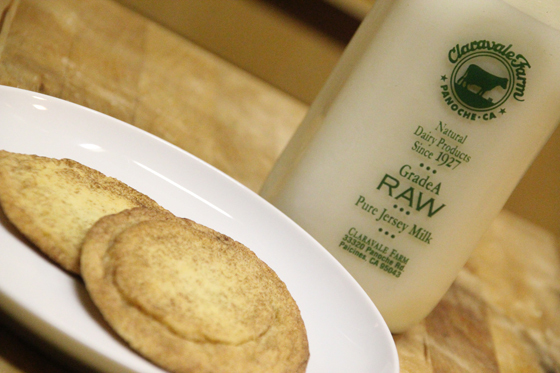 Special thanks to M for her ridiculously awesome Snickerdoodles, which we saved to enjoy just for this delicious taste test. It’s a shame that there are not as many small, quality farms (dairy and otherwise) as there once were in America. Because of the sad change in the US Food Policy that began in the 50’s, more is mass produced, severely lessening the quality and care with which our food is grown, raised, harvested, and brought to our tables. If you read this blog, this must sound like a broken record, but if you haven’t seen “Food, Inc.” and “Food Fight!” please take a bit of time out today to watch these very important films, and take steps to take better care of yourself, and our food supply! And to think that regular home delivery of fresh milk, cream and eggs was the norm. Things were simpler then.